From the Santa Clara Vanguard Web site: The Santa Clara Vanguard is pleased to announce that alumnus Robert Ripley has been hired as the new Vanguard Cadets Corps Director. Robert was a member of the 1988 Santa Clara Vanguard contra section. Throughout his life, Rob has been active in the marching world, first as a drum corps participant with the Troopers and the Santa Clara Vanguard and later as marching band instructor, designer and consultant, having worked with more than a dozen bands in Texas. Read more about Ripley on www.scvanguard.org. Vanguard Cadets also wrapped up successful March rehearsal camp while beginning to learn drill to the corps' 2007 program. Sunday evening, the corps treated friends, family and alumni with a performance at Santa Clara Vanguard's 40th anniversary birthday dinner. 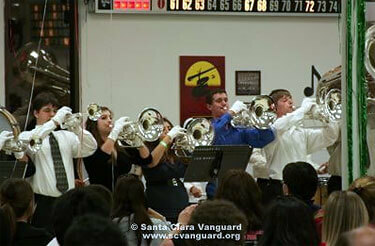 Read more about that this camp on www.scvanguard.org.